Joe Dorish Sports: Who is the Tallest Woman to Ever Play in the WNBA? Who is the Tallest Woman to Ever Play in the WNBA? Do you know who the tallest woman to ever play in the WNBA is? She stood 7' 2" tall. Only 25 players in NBA history have ever been taller than that. This is a very interesting basketball trivia question but it's also somewhat sad because the tallest player in WNBA history has already passed away. To put the height of the tallest woman ever to play in the WNBA into perspective. She was as tall as Kareem Abdul-Jabbar and was one inch taller than Wilt Chamberlain was. 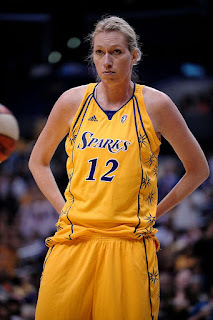 By far, Margo Dydek is the tallest woman to ever play in the WNBA. Margo stood 7' 2" tall. Not only is Margo the tallest woman to ever play in the WNBA she was also one of the tallest women in world history. Margo was born in Poland on April 28, 1974. After playing professionally in Poland, France and Spain, Margo was the first player taken in the regular WNBA Draft in 1998 by the Utah Starzz (now San Antonio Stars). Margo Dydek played in the WNBA for 11 seasons. She is the all-time leader in blocked shots with 877, and the all-time leader in blocks per game at 2.72. Margo was the only WNBA player to record over 100 blocks in a season until Brittney Griner matched the feat in 2014. Margo Dydek blocked over 100 shots in a season four times in her career. She led or tied for the lead in blocked shots in 10 of the 11 years she played in the WNBA. On May 19, 2011, Margo Dydek suffered a heart attack while pregnant with her third child. She was placed in a medically induced coma, and passed away eight days later on May 27, 2011. My all-time favorite WNBA photo is a picture of my favorite WNBA player, Becky Hammon, standing 5' 6", boxing out Margo Dydek for a rebound. For her career, Margo averaged 10.0 points and 6.6 rebounds per game.